What’s the best thing about THC infused candy? Everything! 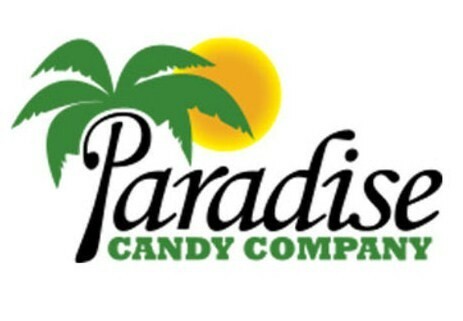 Paradise Candy Company is one of the oldest makers of cannabis infused candies, caramels and lollipops in the country. They’ve taken THC confectionery treats from novelties and dispensary afterthoughts to center stage as serious delivery systems for medication. Here we’ll take an in-depth look at all their candies, as well as their non-edible products, to give you a better understanding of what Paradise can offer—even if your’e more of a chocolate fan. 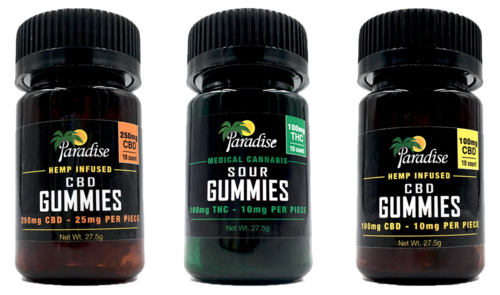 Started in San Diego in 2007, Paradise Candy Company now makes a line of cannabis energy bars, gummies, and tinctures; but it was their powerful hard candies that put them on the map. During this time many SoCal dispensaries were in their formative years, and few had a decent edibles selection. THC candies were relegated to the display case, usually lumped into a glass bowl, and rarely contained more than a few milligrams of THC. That was the norm for marijuana candy and no one took it seriously. Until the summer of 2009, when Paradise Candy received a request to make their lollipops half as strong. Finally, there was a THC sucker that was putting people in the zone and beyond. Bonus:[thrive_2step id=’2684′] Download a free PDF[/thrive_2step] containing The Ultimate List of Medical Marijuana Edibles. Includes hundreds of edibles brands and products, conveniently categorized by type. These candies have kick! Each translucent cannabis infused hard candyare the same size and shape as Jolly Ranchers, making them great for newbies easing into cannabis. They’re available in five different four-packs: fruit (watermelon, raspberry, tangerine, apple), sugar-free fruit, tropical (pineapple, mango, guava, key lime), fruit CBD, and sugar-free fruit CBD. Each has 10mg. The 40mg four-pack not strong enough? Try their 50mg high dose singles. They come in conveniently color-coded packaging according to flavor and strain: apple (sativa), watermelon (indica), and lemon (CBD). Find these THC and CBD singles for about $5 each. Each candy lasts about 10 minutes in your mouth and about two hours on your mind and body. You can double down on the dosage by popping two simultaneously or sucking them consecutively. Also available in sugar-free doses. These caramels will test your willpower. They’re soft, sinfully creamy, and melt in your mouth. Don’t be surprised if you consume the whole pack in minutes, leading to a case of the munchies and more caramels in a sweet cycle of excess. Like the hard candies, these are low dosed: 40mg THC and CBD four-packs (both about $10 each), containing 10mg a piece. They also come in higher dose 50mg THC & CBD singles if you need more relief. 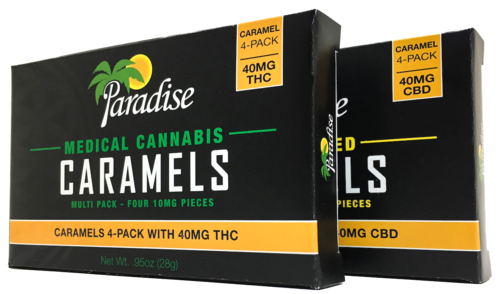 We believe Paradise’s caramels are better-tasting, faster-acting and deliver superior medication than most; what you get in the 4-pack is a better bet than a Cheeba Chew. Want Paradise Candy’s signature fruitiness and effectiveness with a softer, sugary texture? These cannabis infused gummies are the medicine for you. Choose from 100mg THC ($15) or 100mg ($15) and 250mg ($25) CBD bottles, each with 10 colorful pieces at 10mg each. Perfect for new and older patients who want simpler, more familiar products to ease into cannabis. 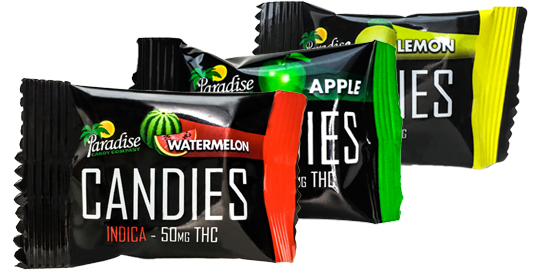 Due to their superior extraction process, Paradise Candy Company is often asked to partner with other medical marijuana companies. Check out these fine products. 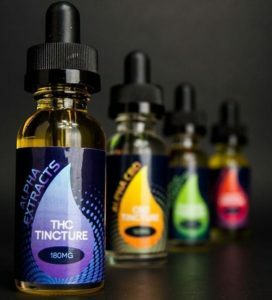 The latest offering are there Alpha Extracts tinctures, which are administered sublingually (under the tongue) with a dropper and come with 30 doses per bottle. Don’t like the taste? Just added them to your favorite drink or use them in cannabis cooking and get more creative while medicated. There are four varieties to choose from: THC (180mg), CBD (120mg), THC/CBD (50mg THC:50mg CBD), and CBD Pet (50mg) for your faithful canine companion! All retail for around $40, except for the (human) CBD, which goes for $50. 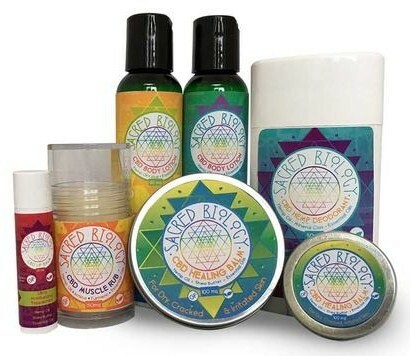 Produced under the Sacred Biology banner, this line of hemp CBD infused topicals are made with organic, cruelty-free ingredients that contain no artificial dyes or fragrances. Perfect for helping alleviate cuts, bruises and other skin irritations. Products include: 150mg muscle rub ($50), 50mg ($20) and 100mg ($40) healing balms, 50mg “relax” and “energize” body lotions ($15), 25mg peppermint lip balm ($10), and a 50mg deodorant stick ($20). Remember, because they’re hemp based you can buy them directly from the company itself. If the edibles we tried are any indication and the testimonials we found are truthful, then Paradise Candies are keepers. You must try all of their scrumptious, power-packed hard candies, pops, caramels and health bars. They taste great and rejuvenate so they’re definitely worth your money and time. Also, don’t save half of a hard candy, caramel or a lollipop for “later,” unless you live alone (and always plan to). It’s uncouth, unhygienic and uncool. There’s one obvious drawback to tasty, colorful cannabis candies—they appeal to children and unsuspecting adults. So never leave them out or within reach of anyone but qualified adult cannabis patients. They have the potential to corner the market on THC and CBD candies if they can be found in more dispensaries, so in the meantime you’ll have to find them yourself, or just rely on Nugg, the GrubHub of cannabis delivery, to get the whole Paradise line of infused goodies delivered right to your door. It’s as easy as ordering pizza! “I have used these candies to help relieve pain I have from Muscular Dystrophy. I also have COPD, so I can’t smoke. I take one sometimes two candies with my meds, and it really helps with my back pain and hip pain. These are only 10 mg apiece, but that is just fine for what pain I am looking to relieve.“ —Paul Q. ”These candies are great for my pain relief. I can’t smoke so I go to edibles. A friend of mine turned me on to this product, and they work so well that I will continue to buy them. Thank you so much for the great quality. For 40 mg it is fantastic. I think 100 mg would be too much for me.” —Sarah W.